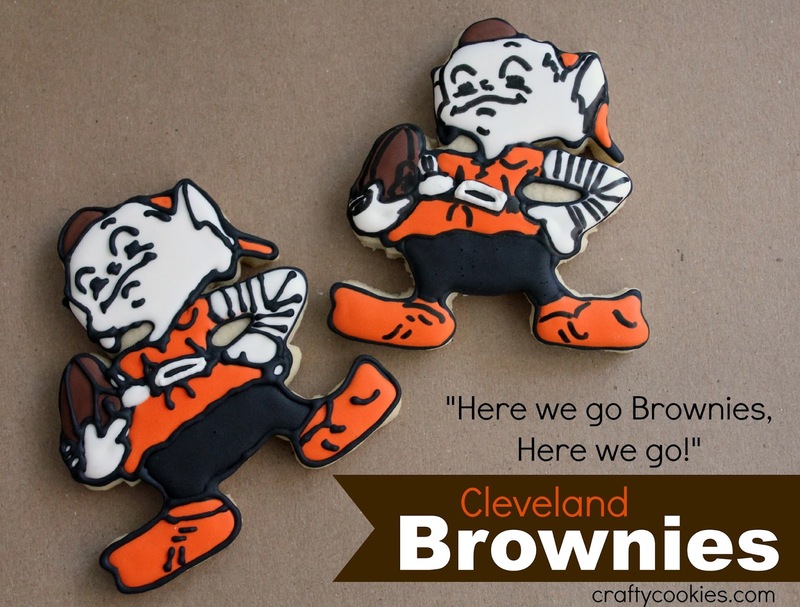 The last time I made Cleveland Browns cookies, my Dad challenged me to make a cookie in the shape of their throwback mascot, Brownie the Elf. I delayed for a long while -- too much detail on the face, too many small parts that would be hard to decorate. But, since I now have access to a 3D printer, I thought it would be time to try and tackle the elf. 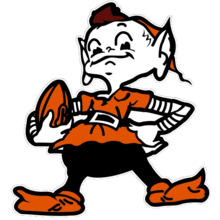 The first thing I did was find a good image of Brownie the elf on Google, like the one below. 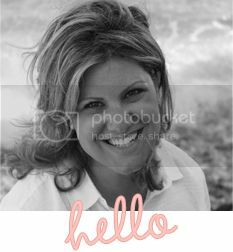 I then used the site cookiecaster.com to help create the custom cookie cutter. By uploading the elf image, I was able to use the site's auto trace feature, which created the outline for me. The whole process took no more than 5 minutes and generated a pretty cool cookie cutter. Since there are a lot of narrow spaces on Brownie, I opted to make the cookie cutter 5", so cutting the dough wouldn't be too difficult. I also set the cutter's blade thickness to extra thin to produce a cleaner cut. From here, I downloaded the 3D file and opened it in Makerware to print on my Makerbot Replicator 2. Makerware is Makerbot's printing software, which you download to the computer connected to the 3D printer. I forgot to take pictures of the printing process, but it took about an hour to produce a single cookie cutter. I printed the cutter on the low setting with an infill of 80 percent. Using the cookie cutter was surprisingly as easy as using other metal or copper cutters, and I had no problems with the narrow spaces breaking. 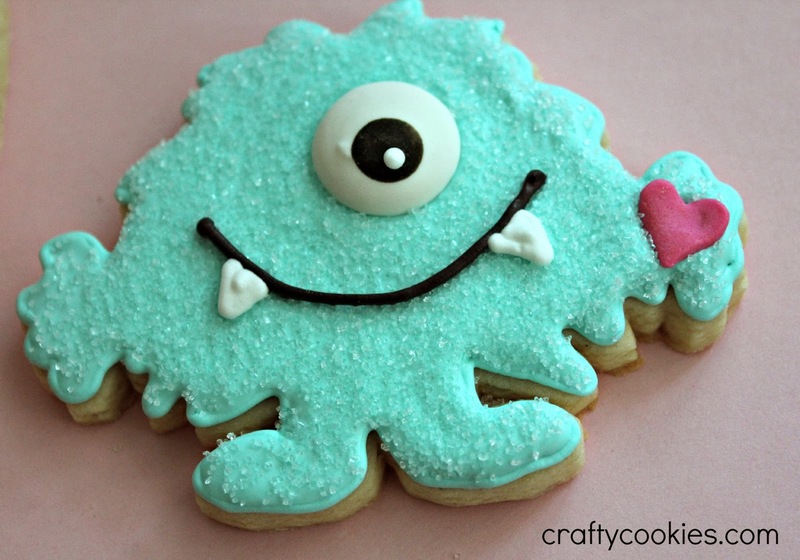 While the cookie only uses four colors, the amount of detail on the face and body made for a bit of a challenge. I outlined the entire cookie in black icing, using my KopyKake. I then filled the rest of the cookie with the coordinating colors using flood icing. For some of the cookies, I used piping icing for the face and body details, but when my hand got tired, I switched to an edible food color marker, which worked just as well. Since I was sending these cookies off to my Dad and brother, the food marker was a safer bet. In my early cookie baking days, I made cookies for my grandmother's 80th birthday with detailed black icing that got smashed during shipping and resulted in some pretty ugly cookies. I've since learned how to properly package cookies (lots of bubble wrap), but you can never be too safe. 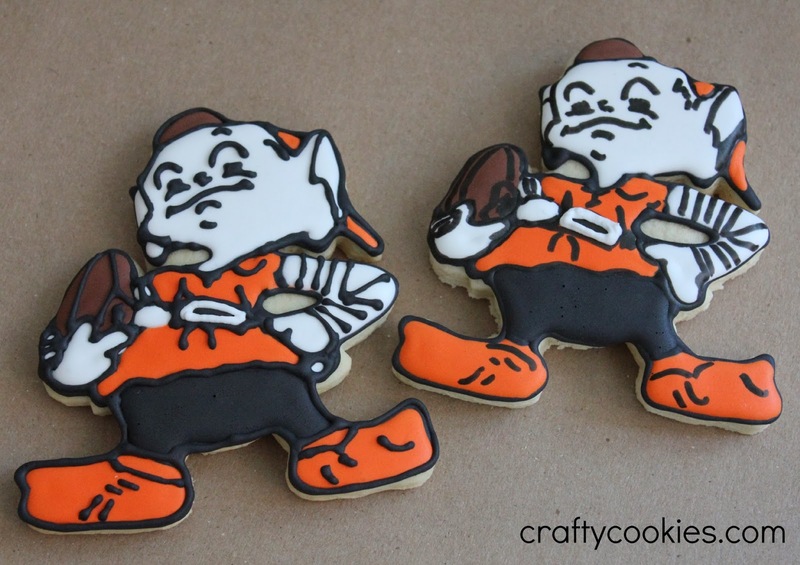 I have a feeling I'll be baking more of these cookies for my Uncle John and some other Browns fans. My Dad now says he refuses to eat the cookies because they're too perfect. Maybe they'll serve as the Cleveland Browns' good luck charm this season. 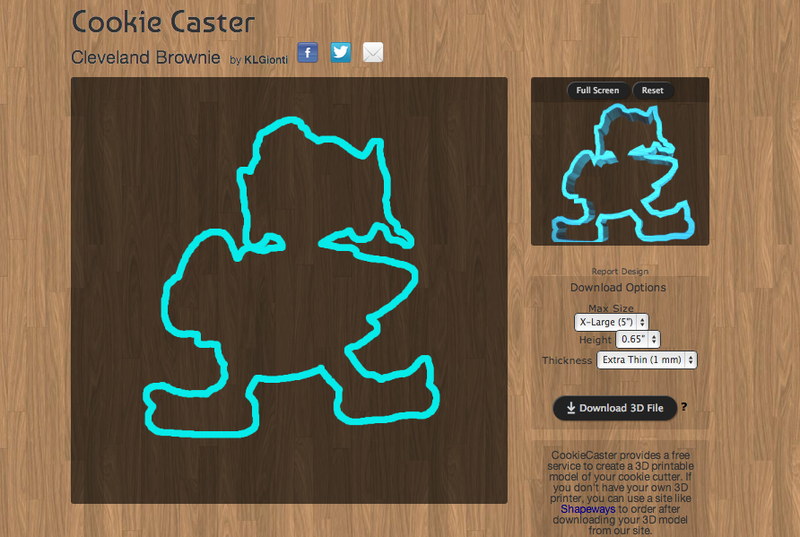 If you'd like access to the Brownie 3D file to print your own cookie cutter (or have one printed for you at Shapeways), you can download it here on Cookie Caster. Are you ready for some love? 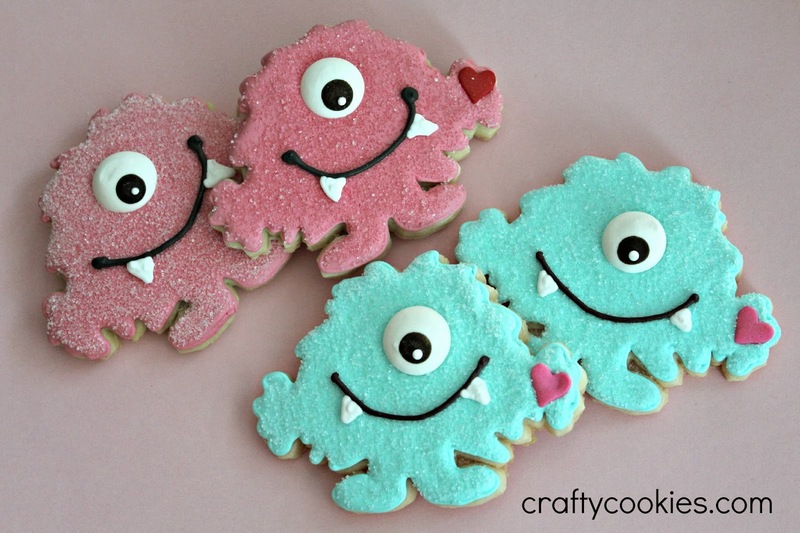 Valentine's Day is right around the corner, which calls for some cookies! 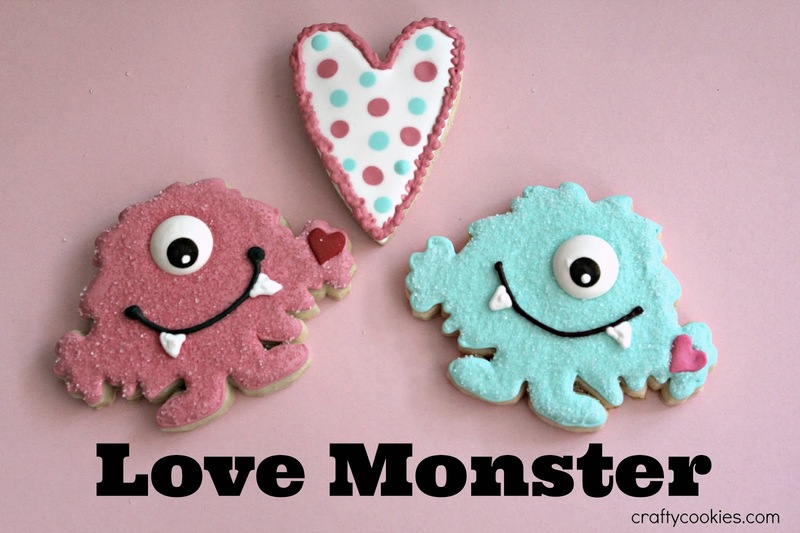 These Love Monster cookies are perhaps my favorite of this year's designs. So easy and yet so cute. I designed the cookie shape myself and printed a cookie cutter on a 3D printer. 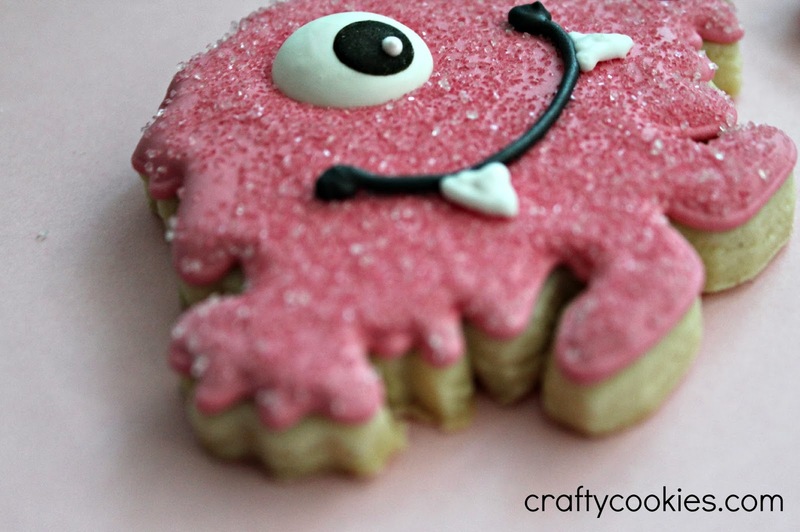 Decorating the cookie was simple, with some sanding sugar for fur and a royal icing eye and heart. I love this little blue guy. He reminds me of Mike from Monsters, Inc.
Of course, Ms. Pink is cute, too! Sending you lots of love this Valentine's Day!